Dude, the errands, they never stop. I got permission last week to stop wearing my sling, which is awesome since I kinda hadn’t been wearing it for some time before then. My shoulder is almost 100% better as are my ick-tastic bruises. Good news, right? Let’s celebrate! Let’s go chop some very difficult things! Meh. Now that there is no risk of permanent damage/deformity, no flagrant disobeying of the doctor’s orders, it’s so much less fun. The discovery of Kitchen Market. Why should I cook? I could live on their black bean soup and perfect cumin-sherry vinaigrette green salads for the rest of my life, or at least this month. We finally got the kitchen clean and I just see no reason to rattle it. I think those 9-stick of butter pecan bars officially pulled me under. I mean, it’s got to be like making that timpano or Death by Chocolate. What is there left to offer after such indulgence? I think I have a baking hangover. I’m cooking a rather large meal for both of our families this weekend, and I need to conserve my energy. I’m so far behind on responding to comments, do I address those or just move onto the Next New Thing? I am torn and will instead do nothing. I actually have been working on a couple things discreetly, but as they are gift-y treats, you’ll have to wait until I actually gift them out to tell you about it. Cooking is a leisure-time activity. These are not leisurely times. See #1. Cooking might cut into my snowflake-crafting time. Enjoy the break and your holiday! I love making paper snowflakes! Yours are beautiful. Last year I cheated and used some patterns I found online, but once I saw how they did it, I was making my own beautiful snowflakes in no time. I’m starting to get a little restless because I have yet to start my Christmas baking, and I’m usually close to done by now. It’s been a crazy month so far. Those are really nice snowflakes! Love them. I feel inspired. I made the granola 2 weeks ago and it came out wonderful. Well, I actually burnt the first batch, but immediately put a second one in and decided to watch it carefully instead of relying on my kitchen timer. My cooking time was much less than yours. Regardless, it came out great! Thanks for the recipe which I will definitely be using again. Enjoy your break and the holidays. I am looking forward to your gift-y treats! Deb…take time off. You have one of the busiest social lives I know. Come down to Memphis, put your feed up on my coffee table and I’ll feed you some monkey bread. Enjoy the season and your loved ones, the baking and the blog can wait. Snowflakes…beautiful…I hope they instill in you the peace and calm they bring to the world when they fall. I’m with Luisa, I love to learn how to like yours! You guys are cracking me up. Didn’t you ever make snowflakes as a kid? Don’t you ever come home from a long day of being a grownup and bust out your scissors and white typing paper (the thinner and cheaper, the better)? I highly advise it! And Jen – What’s monkey bread?! It sounds AWESOME. hahahahahaa donÃ‚Â´t worry, you can get some time off and enjoy the baking without fretting over the blog. From what I see in most blogs, people really do go crazy over the holidays there, here it is a little less frantic. But now I have my own blog, I do understand the feeling of guilt for not writing as often as weÃ‚Â´d like to. But you should focus on those snowflakes (which I agree look awesome, then again, here it is summer so it would be quite ridiculous to cut out snowflakes lol). Basically, just do or cook whatever you feel like doing. And my vote is for not answering the belated comments because youÃ‚Â´ll go absolutely mad if you try to. I’ve been enjoying your site since I found it looking for the punishment cookie recipe. Thank you so much for that and the other yummy recipes. Glad to hear you’re feeling better. Happy Holidays! Totally understand the need for time off. But I will be coming back to you about the Napoleon pasty question later! 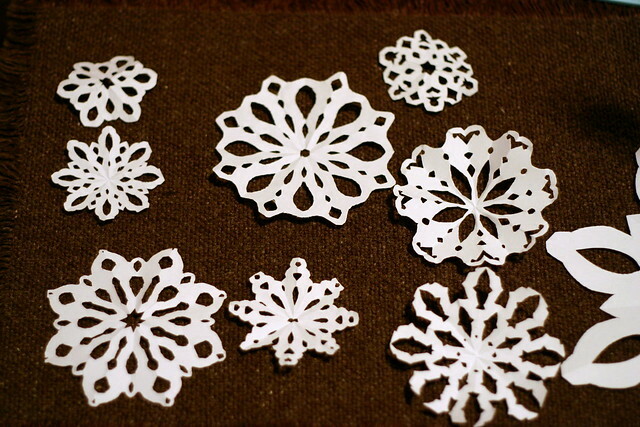 Deb: Awesome snowflake crafting. Mine are..not so much. Yum. Monkey Bread. Oh sure… I just find your blog and then you go and disappear. Get me hooked and then take off. Just kidding! Take care of yourself…sounds like you are super busy. Love the snowflakes! Oh – and monkey bread? I’d take Jenifer up on her offer in a heartbeat if I were you. Yummy! There are a lot of variations, but this is the one that I use, enjoy! Oh and it’s put your “feet” up not feed….TOO MUCH MONKEY BREAD this morning. I’m always super-impressed with your comment responses. I think you respond to every single one. Take a break, unless there is some super-pressing-omigod-it-will-otherwise-burn-the-house-down issue. Mmmm…. snowflakes. I tend to focus on something in the distance and forget all the *fun* things I could be doing instead of plowing ahead…. looking forward to trying this sweeter recipe. and deb, enjoy your break. For some reason I can’t imagine Deb making a recipe that calls for canned biscuit dough. But I could be wrong. Yeah take a break from comments, you don’t need to respond to everyone. :) I still can’t believe you just cut those out with no pattern. Mine never came out so good. We are going to try on Tuesday though (with the little cousins). Happy Friday! I have totally wasted a TON of time on the Popular Front snowflake site. I JUST love it! I cheat on the flakes; got a book from Dover Publications with patterns. My own attempt at making them with paper and scissors is a sad testament to my artistry skills. I will stick with being the kitchen goddess that I am. Shelly – I’m addicted. I made three! And thanks for all your patience, people, I’ll be back in the kitchen today. Hooray for cooking! I hear ya! And snowflake crafting is obviously a top priority this time of year – are you going to show us what you do with them? You know, taking one of your beautiful snowflakes and laying it across the top of a dark chocolate cake, then dustiing powdered sugar over the top would be beautiful and satisfy Alex’s ever loving chocolate cravings would be a perfect way to combine the two… Happy Hanukkah! Right? She does everything exquisitely. And it is good to see someone else commenting about the fact that you are the MOST polite blogger I have ever come across. ps…the morrocan chickpea soup was tasty. I modified it, of course, I didn’t have a couple of the ingrediants… but hey…can something be done to the chickpeas to make them less…annoyingly intrusive? after a minute they are like chewing chalk. I soaked them for like, 10 years and the simmered them for another half century and still. Is it me? Do I just need to accept the fact that the only way I will ever enjoy them is pulverized and forced to play nice with tahini and lemon? Otherwise, man, with the lentils and the cinnamon…it was awesome.